From Christmas to Valentine’s Day, heartwarming second chances and the exhilaration of new romances brought to you from USA Today and bestselling authors. Fall in love again with some of your favorite stories and let new ones capture your heart. Give yourself the gift of A Merry Little Winter! 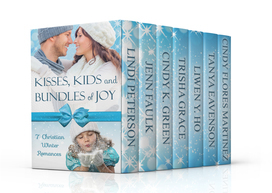 Snuggle up with seven brand new, never before published Christian winter romances from bestselling and award-winning authors. Kisses and kids abound in this collection of novellas that will warm your heart all winter long.